We’d love your help. 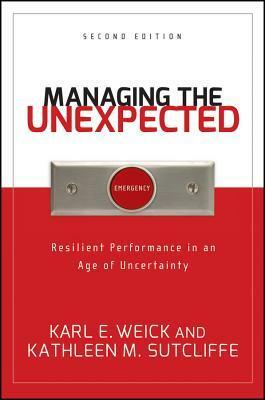 Let us know what’s wrong with this preview of Managing the Unexpected by Karl E. Weick. To ask other readers questions about Managing the Unexpected, please sign up. Fair. No new ground here. A fairly snappy business book that details the qualitites of high reliability organizations -- ones which, if the system or process is comprimised, severe harm can occur. The book does a good job in detailing those qualities through vignettes, and then describing how those qualities can be applied to your organization. Even if your organization isn't an HRO, there are benefits to applying these qualities to it -- even if it's just positive culture change. Very thought provoking and a good reminder that successful organizations focus on how did the system fail rather than who failed. The question their success and their failures looking for learning points and weaknesses and that routine can mask bigger problems. I'm going to have to add this to my to-read again pile. I would recommend this book to every manager, as well as the french "Les décisions absurdes" by Christian Morel if you read french. This book offers a lot of key elements to understand reliability in organizations and how to manage teams. The president of quality at IU health keeps giving me books to read and research to finish. I love her, but I'm strapped for time on some of these. This isn't a long book, but it takes some concentration. My favorite book from coursework in organizational change management this year. I'd say that at its essence this outlines an approach to empowering employees to make sense of their work and act proactively on behalf of their organization. Sensible and too often absent. The book may have been well-written for people already in business. It was not written for someone with little to no background in organizational frameworks. A solid introductory text on "High Reliability Organizations", what differentiates them, and how to bring these qualities to your own organization. Railroaders who were mindless in Houston, blizzards in the Midwest, customs backups at the Mexican border, flash floods, derailments, Hurricane Danny, and inherited labor agreements. One of the few textbooks I've kept from graduate school. This book, recommended by my boss, is about high reliability organizations. A bit dry, would have liked more stories or case scenarios.